Those annoying hard spiky plants inhabit even the most well kept lawns. Barefoot children learn very early in life to ask the question “You got Bindiis?” before running onto the grass to play. We have perfected our ritual Dance of the Bindi without spilling food or drink at backyard barbeques, and can discuss endlessly the various remedies for Bindii removal. Everything from pesky mozzies and sandflies, to more serious funnel web bites and ticks, our bare feet are exposed to some of the world’s nastiest critters. Fortunately with a bit of planning we can avoid most of these by using the right insect repellents. If you do get bitten or stung, particularly on toes, then keep a close watch on any swelling or infection, and seek medical advice early. 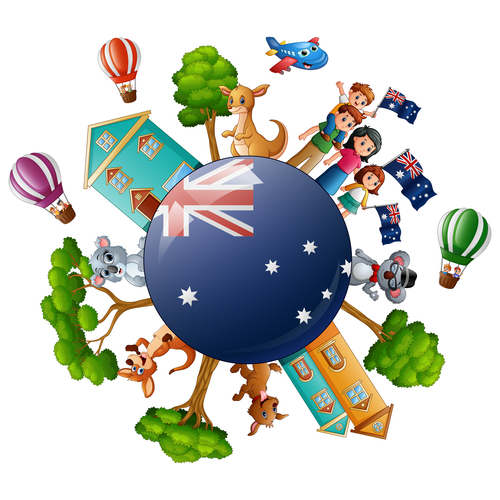 There is good general advice on bites and stings from governments HealthDirect website, and even an interactive Symptom Checker. 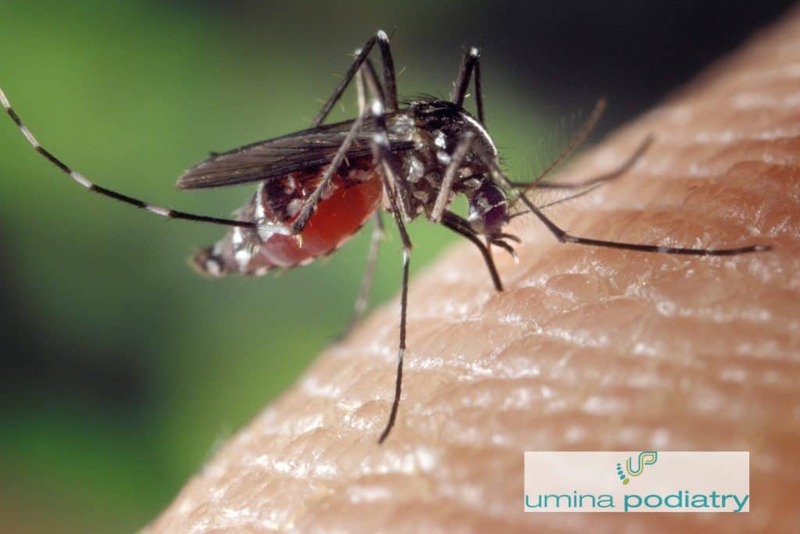 The best advice is to avoid these problems altogether by using repellents and wearing shoes when outside. We are proud of the fact that we have some of the world’s most deadly poisonous snakes, and some people think it’s a good idea to pick them up or play with them. When you look at the stats, that’s a big reason why people get bitten, so best to avoid them if possible. Our feet can be great tools in avoiding snakes, as they are very sensitive to vibration in the ground. Stamping your feet from a safe distance can be enough to deter a snake that is lying in your path, especially if you are in a remote area. Don’t forget that there are many species of sea snake, and most are poisonous. 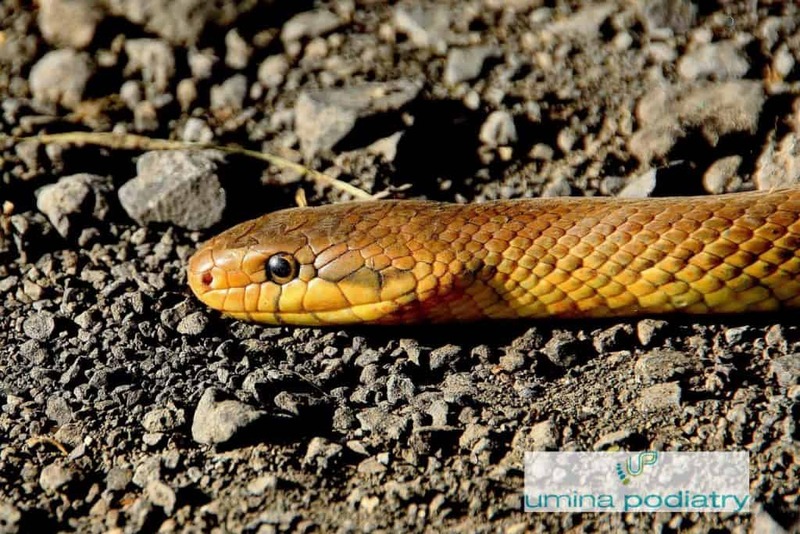 Read about different types of snake bite and what to do about them, including the handy symptom checker. Australia’s favourite footwear does not come without problems. We all know about that old pair of thongs that made us slip on wet tiles, or the blisters between our toes on a really hot day. Luckily there have been great improvements on the old double pluggers, but you still need to be careful, as this unfortunate girl tragically discovered. Fortunately people are sensible and don’t wear their thongs after they are worn or broken, but some still find good uses for them. Surfers can have their own unique foot problems, from kneeling on their boards, applying wax to their feet, and the compulsory barefoot run with their board under their arm. Not to mention coral cuts from crashing into reefs, and the occasional shark bite. Occasionally latex allergy or contact dermatitis can cause foot problems for those wearing booties, but the dedication of these people to their sport often means that even injured surfers will find a way to get back in the water. 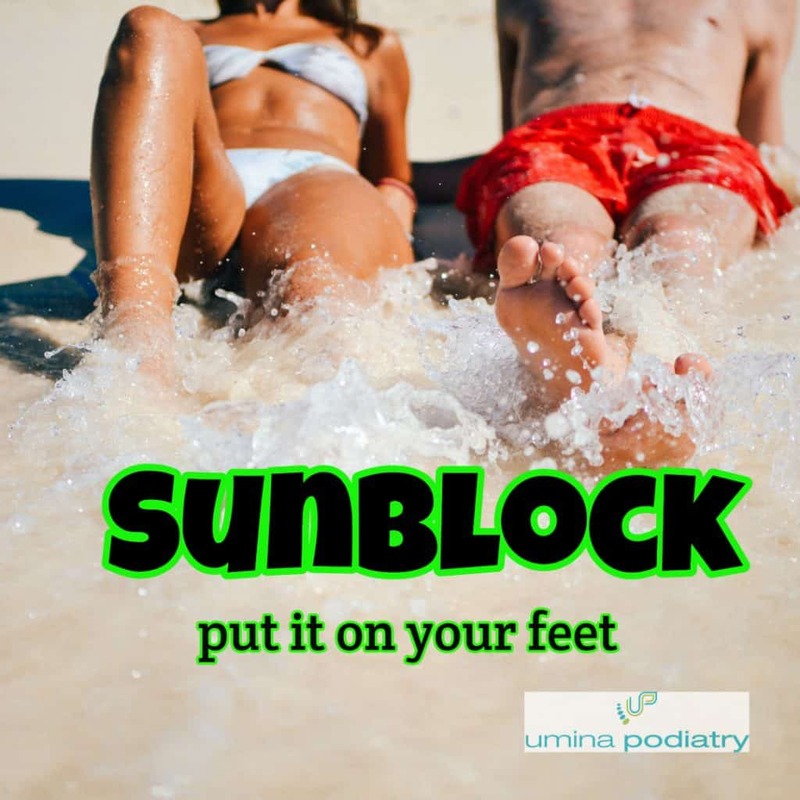 It’s so easy to miss your feet when applying sunblock, especially if you already have you shoes or sandals on. Going barefoot in the sun we often forget that all important blockout , especially if we are in the water fishing or watching kids. Along with kicking the little wheels under the bed, screen door injuries are some of the most common traumas that we see. Rushing through the door it springs back quicker than expected, and that sharp metal edge catches our heel and takes off a piece of flesh. It really hurts, and tends to bleed a lot, and if you haven’t had a tetanus injection, you’ll need one now. The sand on the beach, a carpark or footpath, even a concrete patio or a tiled verandah, can heat up significantly on a summers day. That quick barefoot run can leave feet tingling and sore, and cause significant burns particularly in children. It’s another one of those special dances that we re-learn every summer, trying not to stand in one spot too long, and moving as quick as possible to escape the stinging heat. If blisters form you should treat them as burns and not burst them. Seek advice from your medical practitioner if you suspect infection. 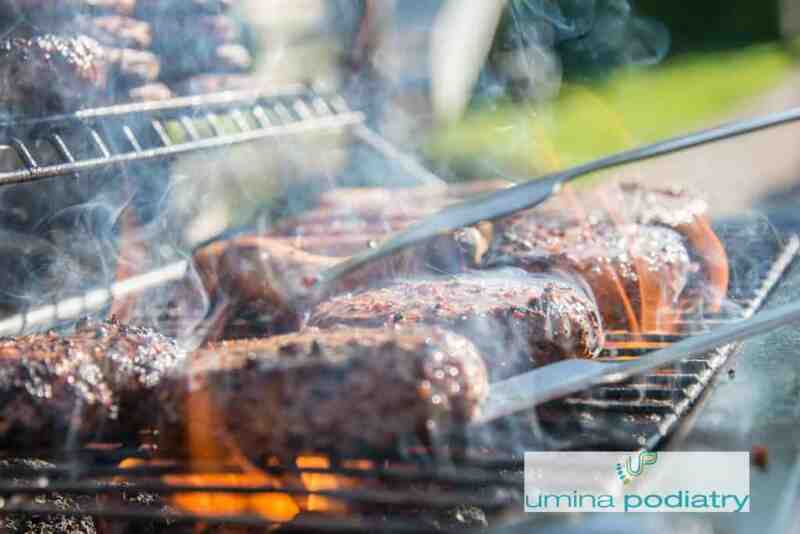 The great Aussie Barbeque is a tradition we all love, but be careful using charcoal or heat beads. Buried charcoal on the beach can continue burning for days – make sure it is extinguished with water before you leave. ← Do I need soft orthotics or hard orthotics?